#7252 Smooshees Critter Cuddlers "Nibble Mouse"
Description: The Nibble Mouse set includes a Smooshee mouse, and a small piece of plastic swiss cheese that the mouse can be smooshed into. This is one of several friendly Smooshee pets called Critter Cuddlers that were sold with a natural habitat they can be smooshed into. Designed for children ages 4 years and older. FPT14771 - Nibble Mouse - Small white stuffed Smooshee mouse with a printed face and other features. 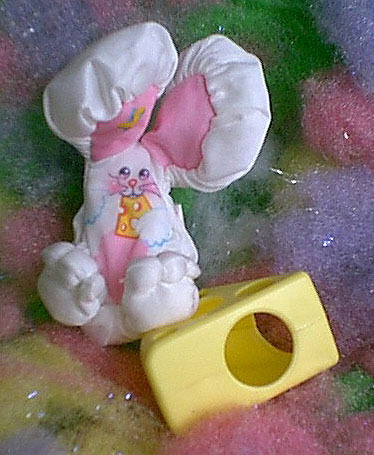 Nibble mouse has large white ears with pink inner ears, a pink tummy, a long white tail, and printed arms holding a piece of cheese to its mouth. Mouse is not marked with a model number, but was sold with a small sewn-on tag marked with a "S" for Smooshees. Measures 4-1/4"tall and about 3" wide (wide ears). FPT14772 - Small yellow triangular piece of hard plastic cheese with 3 large open holes in to to smoosh FPT14771 Nibble Mouse inside. Measures 2-1/4" long, 2-1/4" wide, 1-3/16" high. Sold in a 7" long, 9" high, 2-3/4" deep display box. This set was also sold in #7200 Critter Cuddlers Assortment.